This Key West, Florida resort is 2 miles from the Key West International Airport. The historic 1920 resort features massage services, a private beach and 3 restaurants. This Coral Springs hotel is within a 15-minute drive of Butterfly World. The completely non-smoking hotel offers an outdoor swimming pool. Each room features free Wi-Fi and a flat-screen TV. This boutique hotel is located in Miami, Florida and is across the street from the Atlantic Ocean .This hotel features an outdoor pool, sun deck and Wi-Fi in every room. Rooms at the Circa 39 Hotel Miami Beach feature satellite TV and a work desk. This Orlando hotel is within a 5-minute walk of the Wet n' Wild, a water park. This hotel feature 3 restaurants, theme park shuttle and free Wi-Fi in every room. Rooms at the Coco Key Hotel and Water Park Resort feature a 37-inch flat-screen TV. Only moments from the Gulf of Mexico and beautiful Smathers Beach, this pet-friendly Key West hotel offers comfortable accommodations and modern conveniences, all in an ideal location. Located directly on the sands of Miami Beach only 5 minutes from the Miami Beach Convention Center, this resort features a year-round outdoor pool and an on-site bar and grill. Located on Florida's scenic gulf-side in Marathon, this Bahamian-style hotel is just minutes away from Sombrero Beach, Bahia Honda State Park, and the historic 7 Mile bridge. Coconut Cay features the charm and architecture of a Bahamian village. The Parc Corniche Condominium Suite Hotel is a rare find in Orlando, where you have room to unwind and enjoy your vacation in a large comfortable suite surrounded by the beauty of the Grande Pines Golf Club. Besides our complimentary continental buffet breakfast, you'll have a completely furnished kitchen for times when you just want to stay in and enjoy the privacy of your beautifully appointed suite. Offering free shuttle service to Disney World, Universal Studios and SeaWorld, this Orlando hotel is within one mile of Wet 'n Wild water park. A hot breakfast is served daily. 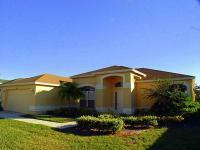 This vacation rental is 4.1 miles from Golf Harbour and within 20-minutes of downtown Fort Myers. Each home features a private pool, full kitchen facilities and free Wi-Fi. This Dania Beach hotel features an outdoor pool, gym, and in-room refrigerators. 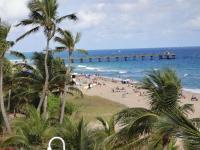 The hotel is within a 15-minute drive to Fort Lauderdale Beach and the Museum of Discovery and Science. Located in Orlando, Florida, this hotel is 4 miles from Universal Studios. It features an outdoor pool, guest services with attraction tickets and free Wi-Fi throughout the hotel. Guest rooms at the Days Inn Universal North include cable TV with. Situated in Indialantic, Florida, this small economy motel is 5 miles from Melbourne International Airport. Built in the 1950s, it features an outdoor pool, direct beach access and free Wi-Fi. 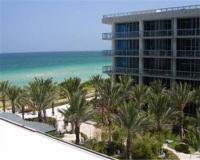 This St. Pete Beach hotel is located next to the Gulf of Mexico. The hotel offers a private beach, 2 outdoor pools, tropical gardens, free Wi-Fi and free on-site parking. Offering spacious 2 and 3-bedroom luxury apartments furnished with all the comforts of home, this Kissimmee, Florida resort offers easy access to top attractions, including Walt Disney World. Nestled in Millionaires' Row of Miami Beach, just minutes from the shops of Bal Harbour and the excitement of the Art Deco District, this hotel offers comfortable guestrooms and relaxing facilities. 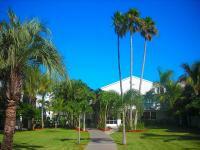 Located off Interstate 75, this Sarasota hotel is only a 15-minute drive from Siesta Key Beach. It features an outdoor pool, jacuzzi and all suites include a microwave and refrigerator. This Chiefland hotel offers rooms equipped with free Wi-Fi and cable TV with HBO channels. It features an outdoor pool and Chiefland Golf and Country Club is just 4.2 miles away. 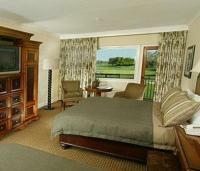 A free shuttle to the Orlando International Airport is available at this Orlando, Florida inn. Free Wi-Fi is available in every guest room. and the inn offers a daily breakfast. Just 15 miles from Walt Disney World and 21 miles from Universal Studios Theme Park, each of these vacation houses feature a 2-car garage and a washer and dryer. Located in West Palm Beach, Florida, this hotel features an outdoor heated pool and guest rooms include free Wi-Fi. The hotel is 3.3-miles from Palm Beach International Airport. 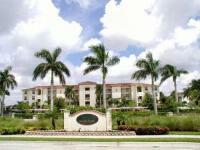 Banyan Trace Condo #304 by MHB Property Management Inc. This Fort Myers property is fully furnished and boasts a outdoor pool and jacuzzi, free Wi-Fi and a complete kitchen. Hammond Stadium is only 3 miles from this villa. The Banyan Trace Condo features a patio. 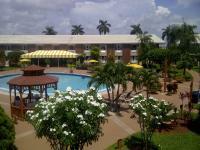 Located near Florida's Southern Coast, this hotel offers a business centre with full business services. Guests can also enjoy a daily hot breakfast buffet. The Palm Coast Hotel is less than 7 miles (11 km) from the Flagler Beach Pier.